When you think of soda you don’t associate it with something that’s good for you – Circle City Kombucha’s Feel Good Soda begs to differ with their fruit based flavors of Kombucha. 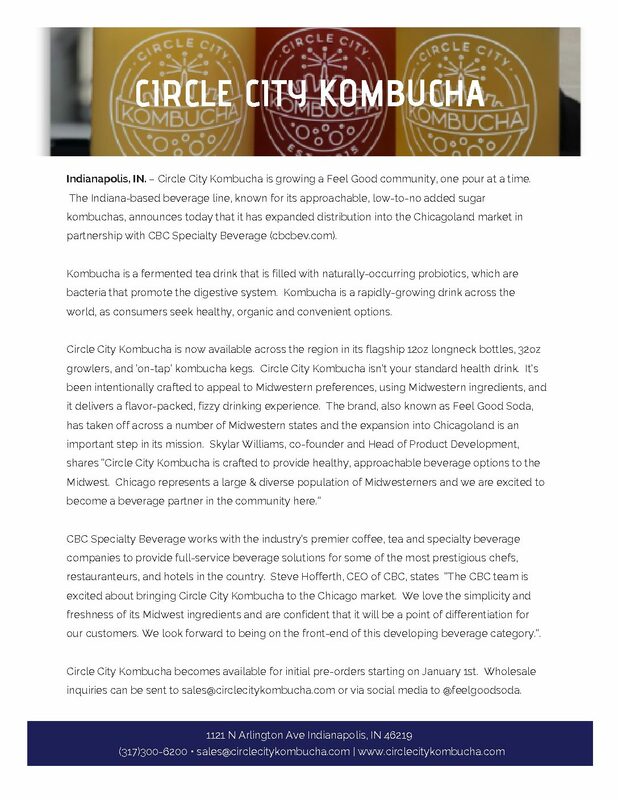 Circle City Kombucha is making an effort to brand their Kombucha as a common everyday drink that replaces a typical high sugar beverage. This sparkling beverage is versatile, just like any soda or juice. In the last few years, Kombucha has grown across America as a healthy drink with many probiotics. For those who don’t know, Kombucha is a beverage that starts off as a tea that goes through a wild aerobic fermentation process. The trio behind the beverage includes Matt Whiteside, Freddy Ferro, and their brewer Skylar Williams. In 2014 Skylar was living in Portland, Oregon, where the Kombucha scene was in full-force. After seeing its return on investment, Skylar decided to brew his own. “I wanted an outlet, something to create, for me it was something that was lacking in my life for a long time,” Skylar said. The first couple batches came out terrible but then came a visit from a longtime friend Freddy, a self-proclaimed fermentation nerd with interest in making his own cheeses, wines, and beer – why not try Kombucha? For Matt the connection came instantly as a TYPE 1 diabetic who can’t drink much, Kombucha became an alternative to water and took the place of diet sodas. Freddy and Matt had been consulting for local businesses here in Indy for a couple years at this point. So, in 2015 Skylar joined Matt and Freddy in Indy as they seen the opportunity to educate the Circle City on Kombucha. Since the launch in late 2015 they have seen continuous growth and support from the Indianapolis community. The growth has allowed them to employ people and create opportunities to help build up the Irvington community in which they live in. “I like to surround myself with positive people, who see opportunity and have a good sense of adventure,” community leader, Anita Johnson said. At the beginning of this year they opened their first brewery and eight months later Circle City Kombucha has almost outgrown the space. My favorite flavors are pomegranate and grapefruit. Pomegranate has a real feel good, fruity taste to it while the grapefruit is more of an acquired taste because of its tartness. In addition to the six flavors that are always available, they also experiment and launch new flavors based on the season. In the past, there have been flavors like Blood Orange, Cranberry, Apple Spice, Pineapple Coconut, White Grape, and Root Beer. Circle City Kombucha makes a concentrated effort to be out in the community as much as possible, setting up shop at the local farmers’ markets and attending events to educate consumers. You can purchase the drink locally at +25 places like Thirsty Scholar, Georgia Street Grind, and more. Click here to learn more about their Kombucha and see a full list of places you can purchase their Feel Good Soda. In the near future you will see Circle City Kombucha with Growler Fill locations around the city. After establishing a solid base in Indy, the plan is to expand the brand across Indiana and get product to college campuses and Northwest Indiana. “We are not just circle city, we are Indiana,” said co-owner Whiteside. I’m excited to see what the future brings for this Feel Good Soda. Make sure you give it a taste and let us know what your favorite flavor is by posting pictures on your social media – tag #LoveIndy and #FeelGoodSoda.